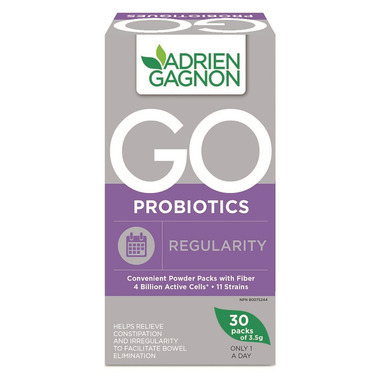 Enriched with fiber, Adrien Gagnon Go Probiotics Regularity is your best ally to facilitate elimination and restore your bowel function. It promotes regularity and gently relieves constipation while the unique combination of probiotics and prebiotic fiber enhance the growth of good bacteria at the expense of pathogenic bacteria. The practical pack format is easy to take, just mix with water or your favourite drink! With 4 billion active cells from 11 strains, probiotics are "friendly bacteria" naturally present in our intestinal tract. Their primary role is to support digestion and regularity as well as protect against pathogens. These living microorganisms are one of the body's primary natural defenses. Inulin is a soluble fiber known as a prebiotic, a source of nutrients for healthy bacteria, at the expense of pathogenic bacteria. Although inulin has a sugary taste, it is not degraded nor absorbed in the form of glucose unlike sugar because it is a fiber. The joint action of prebiotic fiber and probiotics ensures a maxmimum effect on the balance of the intestinal flora and on transit regularity. Directions: Adults take 1 pack daily (For Prebiotic/Healthy bacteria: Take 2 packs daily). Take with 250 ml of water. For use during antibiotic treatment: Take at least 2-3 hours before or after taking antibiotics. Take two hours before or after taking other medications or natural health products since the absorption of these products may be delayed. † cfu: Colony-forming units;* 4 billion active cells until expiry date. Warning: Do not use this product if you have an immune-compromised condition (e.g. AIDS, lymphoma, patients undergoing long-term corticosteroid treatment). Consult a health care practitioner prior to use if you have nausea, fever, vomiting, bloody diarrhoea or abdominal pain, diabetes, if you are taking medications which inhibit peristaltic movement (e.g. opioids, loperamide), if you are experiencing a sudden change in bowel habits that has persisted for more than 2 weeks, undiagnosed rectal bleeding, or have failed to defecate following the use of a laxative product. If symptoms of digestive upset (e.g. diarrhea) occur, worsen, or persist beyond 3 days, discontinue use and consult a health care practitioner. If symptoms worsen or if laxative effect does not occur within seven days, consult a health care practitioner. Hypersensitivity (allergy) has been known to occur. May cause mild gastro-intestinal discomfort (such as gas, bloating, cramps).